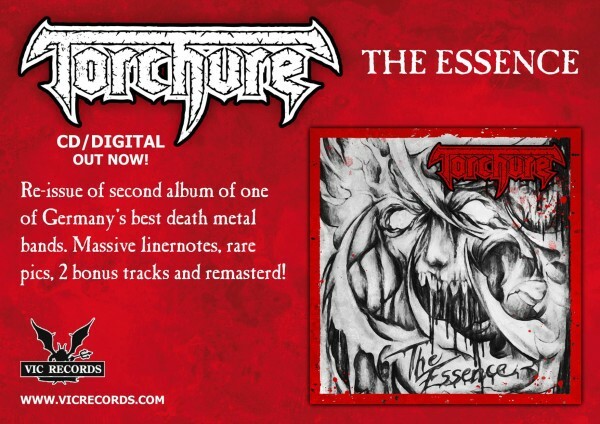 German death metal band Torchure has re-issued its second album, The Essence, on Vic Records. The album was produced by S.L. Coe of Scanner and Angel Dust and comes with very special liner notes, rare pictures and two re-mastered unreleased tracks as bonus. Torchure formed in 1985 and released three demo tapes before unleashing their debut album through German underground metal label 1MF. Their debut, Beyond the Veil (1992), showed a style of death metal with origins in heavy metal that nonetheless managed to be both intense and moody. Torchure toured Europe to support Sepultura and Pestilence. After the tour founding members and brothers Andreas (guitars) and Thorsten (bass) Reissdorf died in a car accident. The band decided to go on and found two new members who were also brothers and with this new lineup recorded their second album, The Essence (1993). Vic Records re-issued the Torchure debut Beyond the Veil in 2013 as reported previously. The reissue of The Essence seems to have received much the same treatment with bonus tracks, expanded booklet and a jewel case CD instead of digipak. The reissue can be ordered from Vic Records directly. Back in the hazy 00’s, psychologist Philip Zimbardo released his book ‘The Lucifer Effect‘, which its title derives from the metaphorical transformation of Lucifer into Satan. It was a study about how good people can do bad deeds, and its substance was mainly on his findings about how prison guards turn to abusing inmates. The ultimate point Zimbardo was trying to make was that there is no good or evil person, since each person can be seduced to “good” or “bad” undertakings. However, torture can be a very sufficient way to throw your enemy into turmoil. With the outright contradiction that is Christian “Metal“, it can catapult the listener into a world of confusion, thus becoming a very suitable device for torment. According to Esquire Magazine, a gaggle of Navy SEALs were using the music of Metallica to torture Iraqi militants. Once Metallica received notice that their music was actually resulting in something proactive, they issued a press statement requesting them to cease. “Part of me is proud they chose Metallica, and then part of me is bummed about it. We’ve got nothing to do with this and we’re trying to be apolitical as possible – I think politics and music, at least for us, don’t mix,” said James Hetfield. Saddened by Metallica‘s decision, the Navy SEALs embarked onward to take things into their own hands and forged the most psychologically destructive torture device known to man: Christian “Metal“. They enlisted the imagery and audio idiocy of Demon Hunter to show the militants true patriotic strength. “Demon Hunter said, ‘We’re all about promoting what you do.’ They sent us CDs and patches. I wore my Demon Hunter patch on every mission – I wore it when I blasted Bin Laden,” one Navy SEAL stated. One could assume that lunatic Osama Bin Laden took the easy route out. 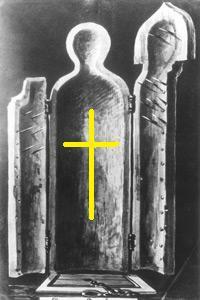 Death before Christian “Metal“.